The attached picture was taken on Wednesday afternoon form the top of Binnein Mor, using an Olympus u1000.To be in the mountains of Scotland in such perfect conditions is no act of chance. Watch the weather forecast do not dither, and go for it. I set out at 4:00 from Preston And was on top of Sgorr Dhearg at 13:00pm. Thanks for the brew. TOM. Thanks Tom. I’m having trouble uploading images just now. I’ll try in the morning. Today I was on Aonach Mor – Siamese Twin. It is really important to have very sharp tools just now, as the ice is very brittle in places and in others it is extremely solid and hard. The same applies to the turf. The weather proved to be rather chilly, with a stiff easterly breeze blowing up the cliffs. The forecast appears to be okay for the next few days. Yesterday Stevo and I had a plan to do White Line III, but when we got up into Coire na Ciste a lot of the routes on Raeburn’s Buttress, including White Line, looked thin and challenging. So because the III looked hard, we moderated our ambitions and went for a IV instead. 🙂 We romped up Comb Gully on magnificent neve in three pitches from the triangular rock on the right with the perfect nut-crack. Alternating leads meant Stevo led the crux, the short sharp icefall just above the triangular rock, on his first IV. The ice was beautiful all the way, but the second pitch did have some hollow bits and required a little care. 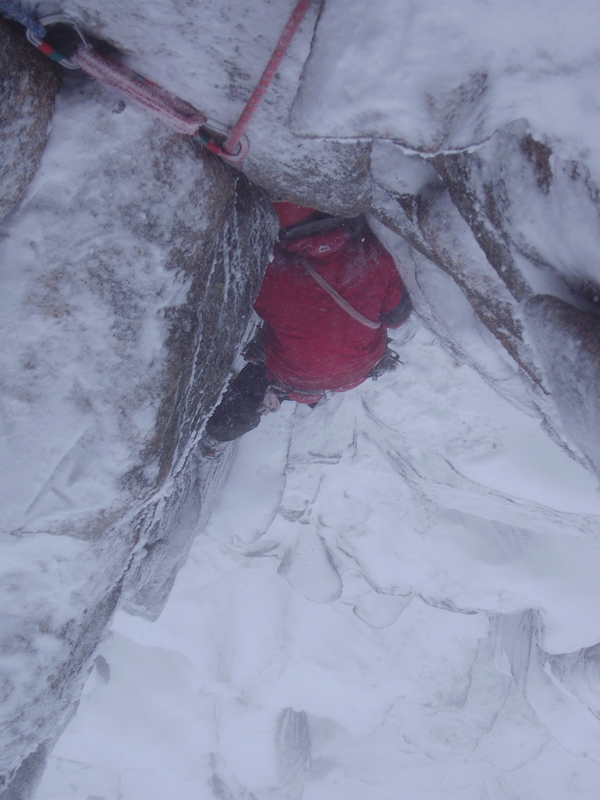 The third pitch (Stevo’s again) was a walk-up, with no cornice to speak of. A very busy day on the hill, although not everything was in condition– the first icefall on Green Gully is a lot harder than III,4 just now. And as your pictures show, the middle of Three Gully Buttress (where Diana and Aphrodite are supposed to be) isn’t really there at all, even though there is a monster cornice above it. Incidentally, here’s my input on this global warming issue. There’s this curious idea going around that the only way to deal with global warming is by individuals making it a matter of personal responsibility to have less fun, travel less, and generally turn themselves into puritan miserabilist eco-fascists. Can’t think where this idea comes from, but it certainly shields the real culprits for global warming– the big oil companies and the politicians–from having to take effective action. Of course we should be careful what we do. But we should stop thinking that being green means we’re never allowed to have any fun (e.g. by flying to Rjukan!). And we should put more pressure on our so-called leaders to address our environmental problems effectively at the political level. 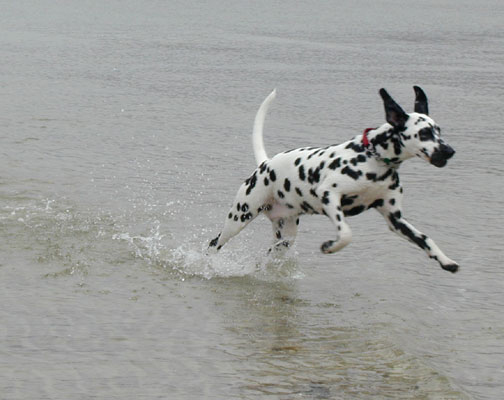 A pleasure to meet your dalmatian, by the way. What’s s/he called? And can you post a picture of the beastie? Yes Tim, the one you met is called Megan. The one in this shot is Cleo. Did Stevo walk off with a key to his room? Amazing the difference a few days can make. See 26th January to 3rd February. Thanks Angie for these two shots. 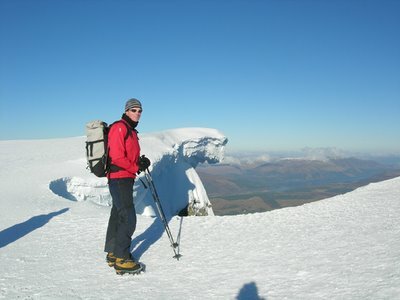 Also today the ice is building according to those out on Ben Nevis. The Curtain was getting better as the day progressed, but still not a good option to climb as yet. The Ben Nevis crag shot by Kevin Rutherford today, shows climbers at the top of Number Three Gully Buttress on Ben Nevis. The Norries were looking splendid today with all buttresses white in Lochan and Sneachda, with the turf well and truely frozen. There was snow falling for 3 or 4 hours as well. We had a very pleasent climb on the Message and there were others in the corrie on various routes. 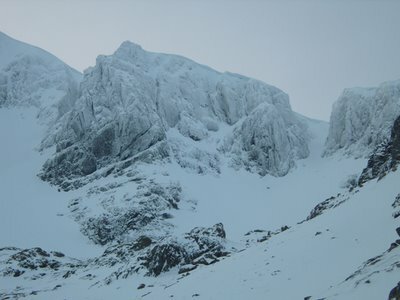 Creag Coire na Ciste on Ben Nevis was busy today with teams on Comb & Green Gully, Central Gully Right-Hand, South Gully, Wendigo and Thomson’s Chimney and Two-Step. All routes are looking reasonable if a little chopped up. Psychedelic Wall, Satanic Verses, Caledonia, Smith’s on Gardyloo Buttress, Tower Scoop, Upper Tower Cascade. Indicator Wall. Good Friday Climb, all getting ascents. One area which looked thin but okay and empty was Upper Cascade above Raeburn’s Easy Route. The snow/ice above 900 metres is truly ‘bombproof’ and a joy to climb with sharp tools.Orion Face Direct has gone and Point Five Gully looked pretty thin. All of the big easy gullies are okay, but Number Three Gully is carrying a ‘Daddy’ of a cornice. ‘gorms ARE blank, blankist I’ve seen this year. 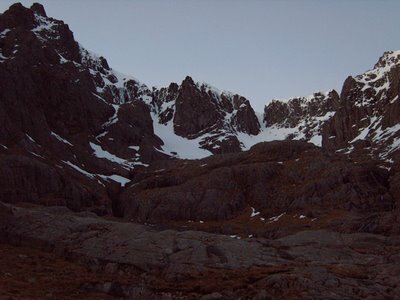 Even the couloir in Lochain has a broken section and many snow gullies are being done on turf, loose rock littered on the surface especially near red gully/goat track gully area – a lot of it is being sent down by climbers on cold days – not just when it is thawing – its just too lean to be holding much of it together. 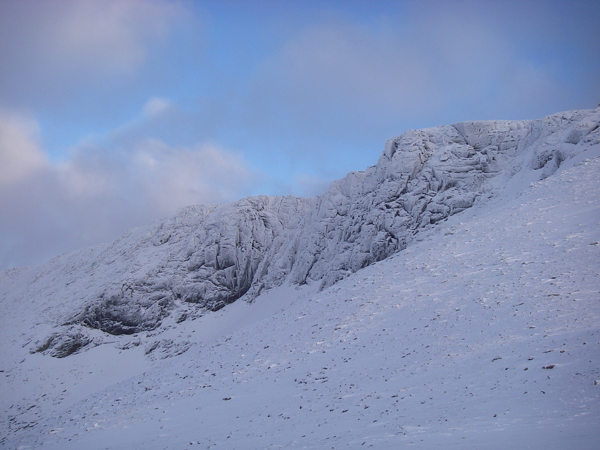 Plenty of neve and big patches for skills though, took a group up the Cas, down Domhain, under Hells Lum (has been icey but all falling down on Saturday – no routes complete) quickly to avoid odd lump of falling ice, up the left side of Feith Buidhe and down above the twin burns of Lochain. Then on saturday built belays and mountaineered our way up and down the side of the Twin Burns in Lochain. 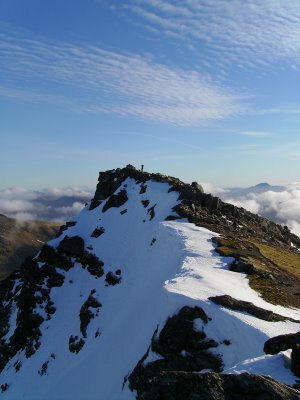 Alan, climbed Ben Lui yesterday (saturday) in fantastic weather. Central Gully and indeed the entire face of the mountain, although not the ridges, have held onto a substantial covering of iron hard neve, with previous climber footholes providing a staircase to the summit. The climbing was straightford but very enjoyable none the less. 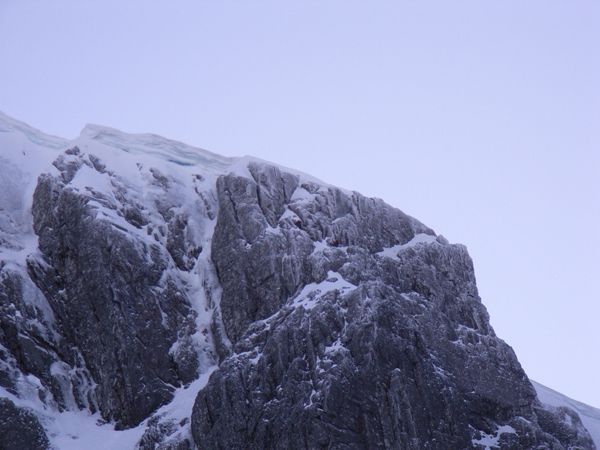 My photos shows my buddy Fred Cochrane close to topping out and the East summit from the West. All in all the day proved Ben Lui still provides a classic ‘mountaineering’ day out. Another very fine day out west. Thanks to David Haygarth for the picture of The Couloir (?) in Coire an Lochan yesterday in the Cairngorms. Check the neat stacking of ice axes, which are clipped into slings and carabiners to avoid dropping them. Also a three-point anchor and a runner close to the stance. With the cooler airstream any, snow left in the high gullies will now be well consolidated. The forecast looks good for a wee while yet. A very fine day today with cooler weather on the way. No groups out just now, but will report back ASAP. 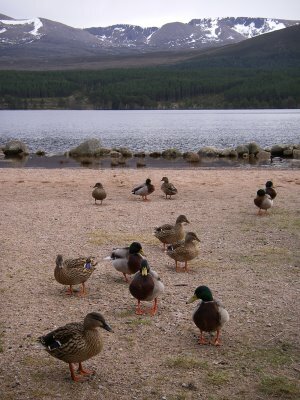 At least the Mallard Ducks on Loch Morlich look happy, even if the cliffs in the distance are looking pretty sick just now! 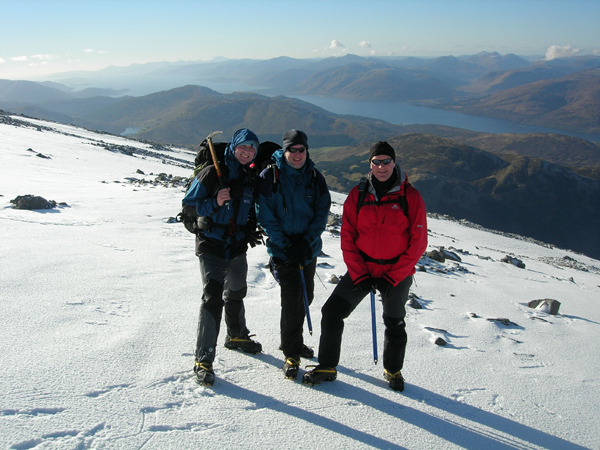 Reports back from Ben Nevis and Aonach Mor reinforce the feeling that conditions are good. 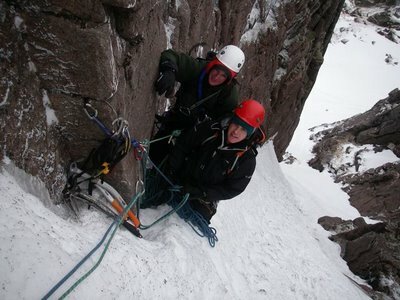 Two-Step Corner and Indicator Wall were climbed today and a number of good solid routes on Aonach Mor. The cooler conditions appear to be working there magic. I have allowed one anonymous comment on to this site recently. It will be the last one, as I believe if you want to make a point you need to come out of the woods and identify yourself. 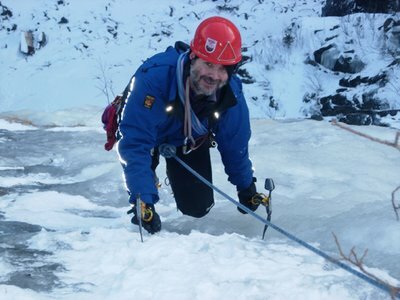 The comment was connected with short-haul flights to Norway for ice climbing and how they are possibly having an effect on global warming. I don’t dispute that this might be the case, but none of us really know if the problem is of our modern making or equally connected with the Industrial Revolution and our Victorian forebearers as well. Also, if we take it to its logical conclusion, none of you south of the ‘Highland Line’ will ever drive or fly to Glasgow and the Highlands of Scotland ever again. What we must all do is to invest in payments in various forms which will be used to develop carbon neutral practices. I hope that by all paying towards this technology, we can all enjoy long holidays in far away places. No doubt this thread will open up a large can of worms! The weather just now is particularly mild and damp. In some ways this will consolidate the deep snow pack which existed last week. A good deal of snow will be stripped, but hopefully the good ice build-up will be largely unaffected on the higher routes. It looks as though drier and colder weather should slowly return over the weekend and into next week and beyond with any luck. Certainly the forecasts suggest that the current mild temperatures will be halved, with minus levels overnight. This should result in some good climbing conditions returning to the west coast. Another good day on Fabrikfossen, opposite the main centre of Rjukan. The route was grade WI3, which back home in Scotland would have been grade IV. A number of lines were possible, with a multiple abseil descent from in-situ gear on trees. Take a head torch AND start fairly early. We started climbing at around 0930 and still got down in the dark. We have been out for a long weekend. This appears to be a good way to get in some quality climbing at a reasonable price. Ryanair to Oslo (Torp) and rent a car. The drive is around three to four hours each way to the airport. A mixture of accommodation is possible. A bit late but if you want a report: Monday 29 Jan we went up Observatory Gully and climbed Tower Scoop (lots of ice but very wet and running with water) and Good Friday climb (good condition). Plenty of Ice on Indicator Wall and Smiths route. 2 of our staff also did No. 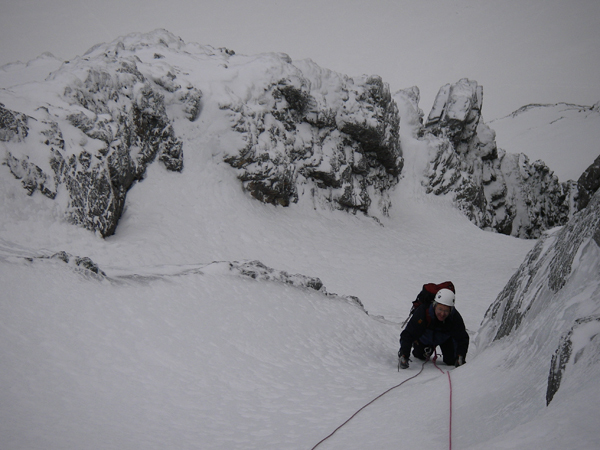 3 Gully Buttress having walked past Green Gully not liking the amount of stuff falling off it in the thaw conditions. We saw a pair of Spaniards who had walked to the bottom of Point 5 but decided again that it was too mild (although looking complete). 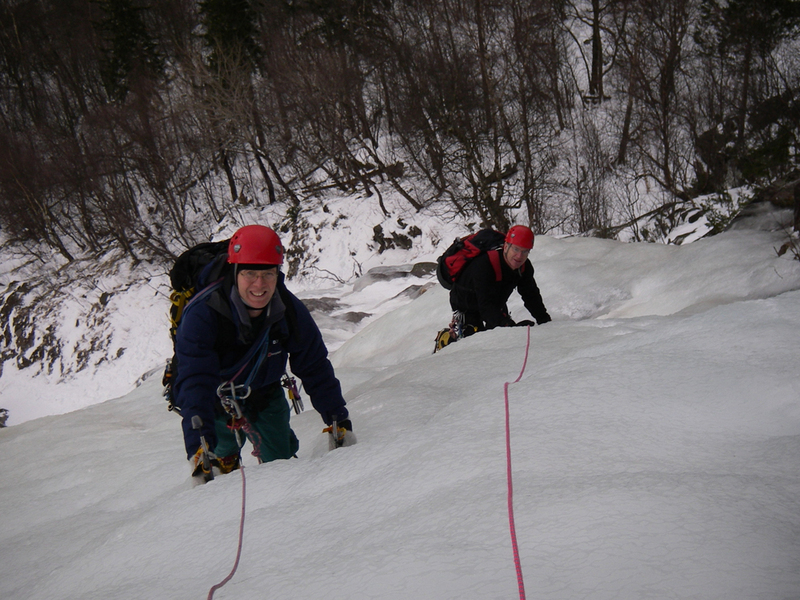 Rjukan looked grand – Fabrikfossen gives a lovely day out doesn’t it? A ten out of ten day according to the lads. This is my first visit to Rjukan in the winter and today was very successful. We climbed Lettvan (WI 2) and Tracy’s Eyes (WI3). Two good starter routes, which would have been grade 3/4 in Scotland. 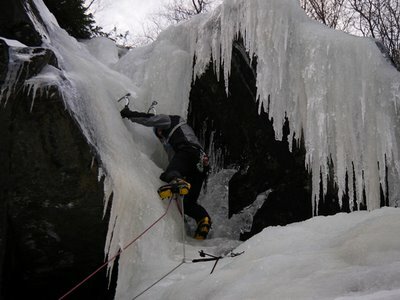 There appears to be enough ice around for a good weeks climbing at least if you have not been here in the past. Some climbers further up the Upper Gorge were on Juvsoyla (WI 6). This was looking pretty thin according to someone who knows better than I do.